A bore water filter is almost always necessary if you are using the water for drinking, bathing, food preparation, cooking or watering edible plants. To determine the best type of drinking water filter for bore water use, it is necessary to first test and treat the water as necessary. We highly recommend that you use a standard Drinking Water Test Kit on your bore water supply at least once or twice a year. Or you can hire a professional to test the water for you. When you know what types of contaminants are in your bore water, you can then determine which drinking filter will be best. In general, drinking water systems that have filters certified to NSF/ANSI 42 and 53 will remove most every type of common contaminant. However, if your water test reveals specific contaminants of concern, some companies (such as Crystal Quest) can customize a water filtration system to meet your specific needs. The water from private bores comes from groundwater, which collects from rain that seeps down through layers of rock and soil. Groundwater also comes from local rivers and creeks. A water borehole is like a well, and some people use the terms interchangeably. 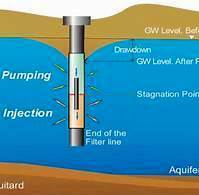 The main similarity is that they both use groundwater. From what I can tell, the main difference seems to be that a borehole is usually drilled by machine and is smaller in diameter than a well. Wells are usually made by hand and have a wider diameter. In addition, boreholes tend to be deeper than wells. According to the Western Australian Department of Health, bore water might be okay to use for irrigation, flushing toilets, as well as washing clothes and cars, but it depends on local groundwater. Occasionally bore water is also clean enough for showering and food preparation. However, bore water is generally not recommended for drinking unless it is tested and treated regularly. The problem is that groundwater can become contaminated by high levels of minerals, chemicals, bacteria and viruses in the soil. and poorly maintained septic systems. We highly recommend always using a bore water filter that provides multi stages of filtration media for drinking water, as well as food preparation, cooking and bathing.